The relationship between technicians and artists, and the artwork is an interesting one. For me, as an artist the making is intrinsically linked to the thinking, these are not separate actions – one to follow the other, but each ongoing, with one informing the other. A practice that is led by process. Technicians play a largely invisible role in the artwork from a public perspective – however, without technicians, it seems that many artworks would not be possible, from works largely made by technicians, to those informed by discussions and the expertise, and knowledge that is held by the real technical experts. I’ve wondered if this distinction between concept and technical skill has always been as separate. Contemporary art does get a bad press, as art education has stepped away from a skill-based approach, to a theory- and concept- based approach, but some of the skills – particularly casting and foundry work has been separate from that of the modeller or artist traditionally for much longer. The etymology of technician goes back to the Latin and then the Greek (in case you are interested), Tekhne – which encompasses art, craft, skill, method or system of making – keeping the two very much intrinsic to each other. But never mind the past for a moment, what about the future of the artist as a skilled maker? It seems that skilled based artists are back ‘in’ again, with artists like Phoebe Cummings and her elegant, spectacular raw clay works, and the resurgence in sign painters in the design world. But within the mainstream contemporary art world, most skilled works are still carried out by skilled makers – as separate from the artist-conceiver. As my current work is to create a permanent piece of public sculpture, I’ve been really enjoying the process of being both the artist and the maker, but the technical support has been a central key for this work to be possible. The balance between control and responsibility allows the work to be more responsive, but also has to account for my own limited, if improving skill set. I’m already looking to further expand my skills and technical ability following on from this project, (ok, I admit, this is always my goal) but has also opened up routes for a more collaborative approach to working with experts in the future. Huge thanks are in order for a whole host of amazingly talented people who have been supporting me on the tattiefields project, with a big thank you to the stellar humans Eden and Uist up at the Scottish Sculpture Workshop for all of their support and calming influences during my residency last month. Work is not done yet. Stay tuned for the final results, coming soon! 2015 began with the purpose of specifically working outwith the gallery setting. In this way, it failed entirely. In the end up, I worked on seven exhibitions, including curating one. I visited almost none, in contrast to my regular gallery trekking up until then. By the end of SUBMERGE, the year had more become an exploration in what the gallery context means for art making, and specifically who the audience is that the work is being created towards. Although there is of course an entirely self-driven part of myself, that demands to be let play in the studio without speaking or even considering the world beyond, I still strive for art that communicates, discusses, asks questions, involves and co-creates with those that travel to see it. I’ve stropped and stormed about gallery audiences and white cube gallery contexts- but none of my whining ever really identified the real challenges of creating meaningful, useful, interesting work for meaningful, useful or interesting exhibitions. I kept asking what exhibitions were for. If they were to share art – new and otherwise – with the art community, then some were successful enough. But the art community is looking often without looking; they may be some of the art world’s biggest fans, but the over-saturation can lead to a deadened look in the eyes of some art-family veterans as they make quick march around the exhibit halls, room and inbetween spaces. But they can be a sympathetic, and caring crowd. If there are buttons to be pressed, objects to be examined, swings to be swung on, it is the art crowd that will play. They have permission. And the knowing of where they stand. But what to say to our art-loving art-making crowd? One opening in many, little will stand out beyond the closing drinks and afterparties, never mind beyond the close of the exhibition itself. Gallery culture invites us to step in from outside, to pause in the chapel-like quiet, adjust our eyes and breathe in deeply the cool and still air, before emerging back into the world, refreshed and suitably cultured. I made new work I loved, I saw the work of others that I loved even more, but still was not satisfied. The lack of engagement, communication, feedback and even awareness of audience dulled any enjoyment involved in the making, planning and install. Conversations about the work were so limited as to make the whole endeavour feel nothing beyond ego-centric self-congratulatory navel gazing. Curating was in many ways, a different experience. Inviting artists to create a space with me, my first desire was to reject ‘exhibition’. After a month or thereabouts, this became obviously impossible due to my creating an exhibition, or, ‘space-filled-with-art-that-things-can-happen-in’. The desire to have an arts space where exhibitions don’t happen prevailed throughout and added to the general confusion. Exhibitions are all about context. They are not just a bunch of art objects curated in a white cube space. Instead consider an exhibition for the place in which it is to be concieved/recieved. Whether on a micro- level, or a global level (or both), it seems that the most interesting exhibitions are those that feel relevant, connected and driven by momentum and currents. Exhibitions still ring with me a romantic notion of Victorian expos – of new discoveries, inventions and ideas. This has possibly led to my disillusion with exhibitions over the past few years: too many experiences of staring vaguely at any variety of work between beautiful, mundane, awe-inspiring or gruesome, but in a completely disconnected enivronment of clinical emptiness, or run-down art cliche. Leaving a gallery space and crash-landing into the outside streets air of the everyday threw the importance of the work out as often as not. The few works that stuck held seemlessly to the places they were shown (not necessarily made for), or played creatively with the context of their being. The act of journeying to visit works, still stands. This is an increasing challenge in the exhibition context, rather than the opposite as might seem apparent. Journeying to a nearby out-of-context location is more challenging than travelling several hours to experience a work where it makes sense. Exhibitions are not about the texture of your walls. Invigilators are all powerful. They can curate individual experience without even directly speaking to a visitor. Each conversation had shapes the context of the exhibition, not just for the visitor but also for all those involved in creating it in the first place. By creating the exhibition-as-forum, each artwork becomes a conversational starting point, inviting tangents of all descriptions, exchange, uncertainty and redefining of the collective creation. Interesting. Good conversations do not need too much curation, just the right context, the right invitation, and good soup. The best exhibitions should be about creating conversations. The unexpected can be a magical gift in making a good experience truly relevant and exciting, even if by the same turn can wreak havoc and uncertainty with the general populus. (This is not an excuse or rallying call for flooding). Exhibitions can tell powerful stories, that grow and change with each visitor. This exhibition is not complete. Huge thank you to all the artists, curators, producers, gallery folk, visitors, friends and general stumbled-in-here-whilst-looking-for-something-else types, that have had the patience and kindness to work with me and share conversations over the past year whilst I stumble around figuring out what being an artist is about. Thank you all for such great opportunities! 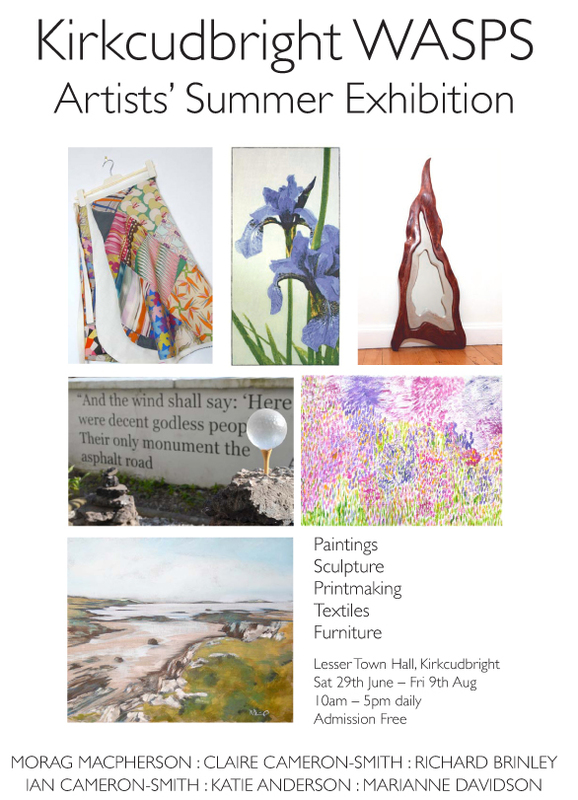 Summer Exhibition – One week to go! No time to stand and stare! A couple of days off and then back to the studio, which feels like I’ve barely been there for the past week or so whilst all the Guid Nychburris shenanigans have been kicking off. However, onwards is the theme for me this summer so onwards we head. Next off, the WASPS annual summer show in the Lesser Town Hall in Kirkcudbright. Running from the 29th of June (next Saturday), for six whole weeks to coincide with the main exhibition up the stairs – there’s little excuse not to visit. The walls are up, I’ve even thrown some paint at them in an attempt to present something bordering on respectable – but this is looking like a full on week to get things finished up.